Tomoya later marries Nagisa, where they soon have a child, Ushio, together. But upon giving birth, Nagisa dies soon after. Having felt he has lost everything, Tomoya leaves his daughter Ushio to live with Akio and Sanae for the next five years, where he constantly works and wastes money to forget the pain of losing Nagisa. When Ushio turns five years old, Tomoya reluctantly takes her on a trip with him, where they quickly bond and he asks Ushio to stay with him. Ushio contracts the same illness as Nagisa, and, grief stricken, Tomoya quits his job to take care of her. She begs to go on a trip with him, and he agrees. As they walk towards the train station in the snow, Ushio collapses and dies in her father's arms. 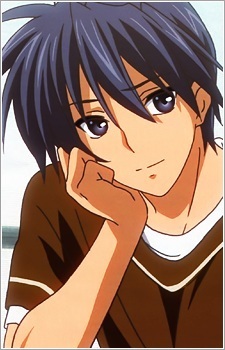 Tomoya, crying for Nagisa to help him, collapses soon after, and awakens to a world where Nagisa and Ushio survive. It is later found out that Tomoya had used the orbs of light to grant his wish of his wife and daughter surviving. The three live together happily as a family.